Despite the fact that I use my Crock-Pot all the time, I haven’t posted a slow-cooker recipe here in almost six months. How is that possible?! Well, certain slow-cooker favorites (like this, this, and this) are such big household hits that I haven’t had as much need to try out new recipes. That’s a pretty darn great problem to have! 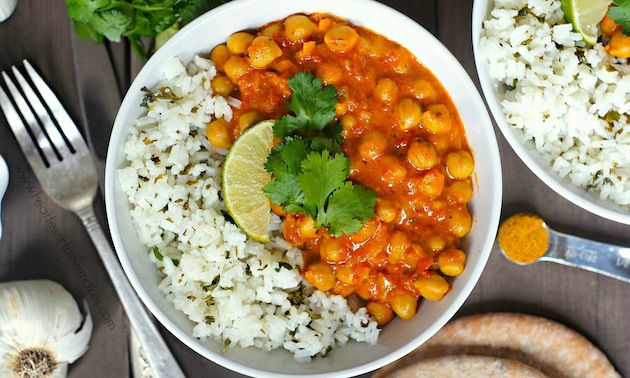 However, my toddler has become a huge fan of beans, legumes, + meatless meals, so that inspired me last month to try this wonderful Chickpea Coconut Curry. Do not be fooled by the short, simple ingredient list – it is packed with beautiful, bright, complex flavors. Since then, it has been in frequent rotation in our home, impressing both the adults + the kiddo alike. My favorite way to serve it is as pictured, with Cilantro-Lime Rice (which is SO good), but it’s also tasty with plain white or brown rice, quinoa, farro, or naan. While this turns out beautifully in the slow-cooker, it is easily adapted for quicker cooking on the stovetop, which I’ve done when I left dinner-planning until the last minute. =) Simply saute your onions/garlic in a medium saucepan until tender/translucent, then add in the other ingredients as described below. Bring to a boil, then reduce to a simmer + cook, stirring occasionally, until the chickpeas are heated through and the sauce has thickened to your liking (about one hour for me). Whether you cook this on the stovetop or in your slow-cooker, however you serve it, I know you are going to be wowed by it — it really is a scrumptious meal! Heat a large nonstick skillet over medium heat. Add oil to pan; swirl to coat. Add onion and garlic; sauté 5 minutes or until onion is tender. 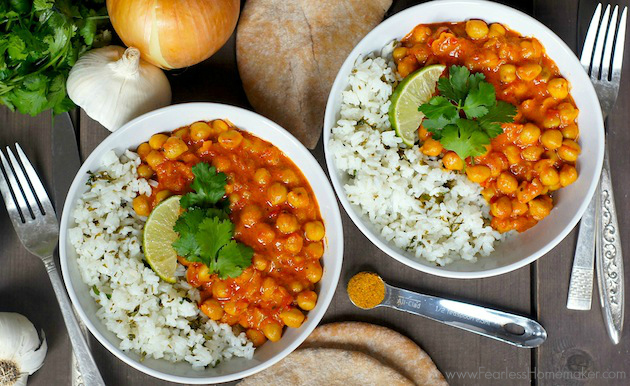 Place onion mixture, chickpeas, diced tomatoes, coconut milk, curry powder, and salt in a 3 1/2-quart electric slow-cooker; stir well. Cover and cook on LOW for 6-8 hours. Stir in cilantro + serve immediately. I saw this in CL and wanted to try it too!! Looks delish! Oh this looks like a wonderful dish. 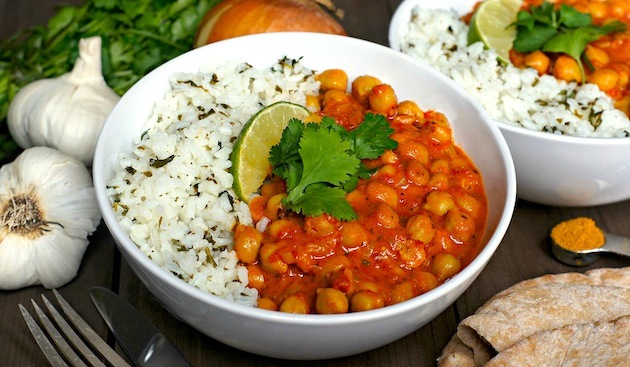 We love chickpeas so I definitely have to try this! So beautiful, fresh, and vibrant! This looks wonderful! I just made something like this last week! I made it on the stovetop though, so I’m curious to try it in the slow cooker. That will probably help meld all the flavors together. And I must try your rice. I’ve seen it multiple times now and I keep telling myself that I should make it but I get lazy and just make the normal stuff. My mom just gave me homegrown chickpea and wasn’t sure what to do with it – will definitely try this! Even the rice looks good. Your slow-cooker recipes are the best! This is a beautiful dish that I will definitely be trying! This looks awesome!! I love making veggie-based meals as often as my hubby will let me get away with it. 😉 He does love curries though, so I think this one would be a winner all around! You post the most delicious recipes. This curry looks awesome! OMG girl! This dish is glowing inside and outside. Looks amazing and simple to make. On my cooking list! Next post: Kid-Friendly Green Snacks for St. Patrick’s Day!